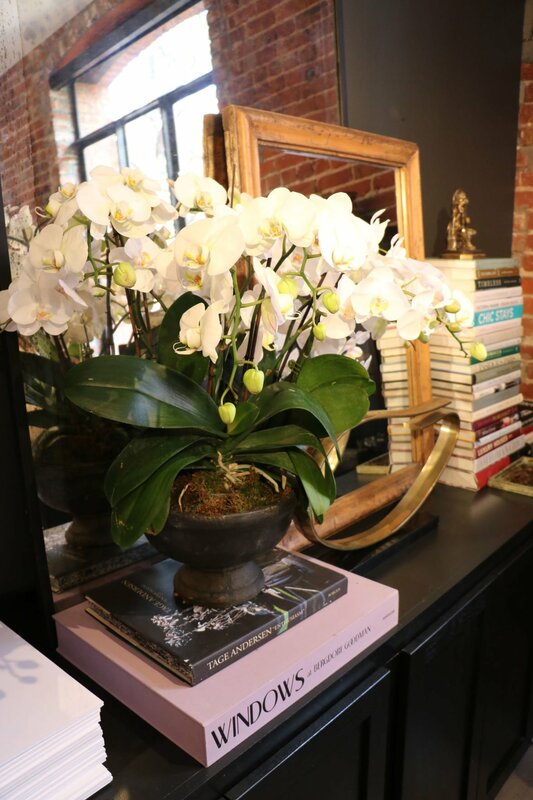 Monica Bhargava, Pottery Barn’s executive vice president of design, combined real and faux orchids to give a lush, fuller appearance to an arrangement in her office, from Pottery Barn. Pottery Barn’s Garden Botanicals category includes such faux plants as hydrangeas, tulips, succulents, topiaries and small trees. A faux orchid Instagrammed by blogger Emily A. Clark, who got it from the French Bee at One Kings Lane. A dahlia ranunculus floral arrangement from Joss & Main in a decorative vase. Handmade paper anemones by Livia Cetti of the Green Vase ($38 per stem, shop.thegreenvase.com), by Kate Mathis. No longer the pariahs of decor, fake flowers are showing up at some of the best addresses. "There is a place for faux flowers today," says Whitney Robinson, editor in chief of Elle Decor. "They are essentially copies of what you would buy fresh." Although beautiful arrangements such as the bowl of 400 fresh lavender roses at a Zurich restaurant star in his Instagram feed (@whowhatwhit), Robinson recognizes that "not everyone has the time or budget to be able to buy fresh consistently. We are entering a new era in faux flowers as well, toward a new generation of paper flowers that takes the artistry to the next level." In the past few years, consumers have embraced artificial flowers, unapologetically welcoming the silk, polyester or poly-blend version of succulents, orchid plants and hydrangea bouquets into their homes. Although they might have once carried a stigma, perhaps harking back to a dusty arrangement on a grandmother's coffee table, the tide has turned, thanks to modern materials and more sophisticated designs. Decorators and design bloggers feature faux flowers in their projects and on social media. Retailers are selling individual faux blooms as well as prearranged mixed bouquets and planters. On Etsy, roses and poppies spring forth in polyester and in tissue paper. 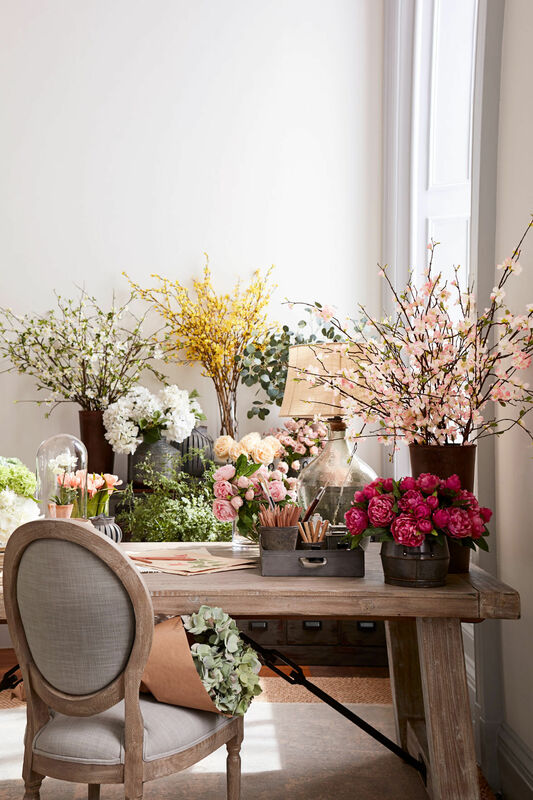 Monica Bhargava, Pottery Barn's executive vice president of design, often mixes real blooms, such as fragrant roses, along with faux on her office desk in San Francisco. Pottery Barn has created flower shops for its faux line and created videos about how to design with them. The charm of handcrafted paper flowers is captured by artisans such as Livia Cetti, a paper-flower artist working in the Bronx who was once a stylist for Martha Stewart. She has written two how-two books on paper flowers and sells her wares at high-end shops such as John Derian in New York and on her website, the Green Vase (thegreenvase.com). Design bloggers, who are always photographing their own spaces and looking for ways to add color and interest, have hastened the flowering of faux. "People want to have the fresh-flower look in their home," says Donna Garlough, style director for Joss & Main. "These let them get the look without the expense or the maintenance." Although there's no watering, artificial flowers need care. Garlough says that when you unwrap them, "they need a bit of 'zhuzhing,' but so do real flowers." So move them around a bit and fluff out the branches if needed. To keep silk or synthetic arrangements dust-free, you can clean gently with a soft, dry cloth or use the small brush attachment of your vacuum. Keep paper flowers out of direct sun and high-humidity areas. A blow-dryer can be used to get the dust off.